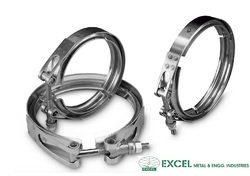 Manufacturer of a wide range of products which include stainless steel worm drive hose clamp, T-bolt clamp, mild steel worm drive hose clamp, jolly hose clips (MS & SS) and PP clamps. V-Band Coupling is used to join Piping, Tubing or various Gas or liquid tracks or closers, separators or enclosures. From the above Assembly figure it can be seen that the tapered inners of the V-sectors are mounted over their respective matching tapers of the pair of flanges of the jointing pipes.The tangential pull FT created by applying torque by turn of nut causes uniform radial force Fr all around. This causes wedging action force Fw along the tapered area of the flange at its perpendicular. The FW in turn has its resolved component force Fx along the axis of the flanges or pipes which effectively serves in firm and uniform fitting of the two flanges along their faces.